David Peter "Pete" Lunde, age 85, of Necedah, WI, passed away on Sunday, March 17, 2019 at his home surrounded by his loving family. He was born December 22, 1933 to Arnold and Marguerite (Tibbits) Lunde in Madison, WI. Upon graduating high school, Pete enlisted in the Navy where he was active for 4 years and in the Navy Reserves for 12 years. 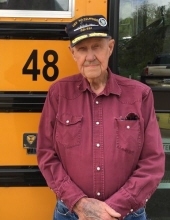 Pete spent the majority of his days working, having worked for Madison Gas and Electric for 22 years, the Railroad for 21 years, and most recently Necedah Area School where Pete was a bus driver for 43 years. Pete received the "Excellence in Driving" award presented by the Wisconsin School Bus Association in 2018. Pete also had his very own special business "Pete's Repair Service" fixing furnaces, water heaters, and a little bit of everything. He never left anyone hot on those 90 degree days or freezing on the blistery winter days. On May 27, 1961 Pete was united in marriage to his love Nancy Jean Doyle at St. Mark's church in Madison. This union created wonderful memories and a life to never be forgotten. Pete and Nancy shared 54 years of love and cherished moments together. When Pete and Nancy moved from Madison to Necedah, together they ran the bar in Finley, WI for 6 1/2 years. They were also very active in the Necedah Lions Club. Pete loved the Lions and everything they stand for. Pete was always doing something good for someone else. Most of all, Pete enjoyed spending time with family and friends. Pete and Nancy loved to take trips in their motor home and often took their grandchildren camping making wonderful memories. Pete loved to hunt in his younger days and fish in his older days. When Pete wasn't working or having breakfast at his favorite restaurant, you would find him in his garage watching the Badgers, Packers, listening to polka music or just tinkering. He is survived by his children, David (Susan) Lunde of Rio Rancho, NM, Karen (Laurence) Gasienica of Friendship, WI, and Susanne Wollschlager of Necedah; grandchildren, Jessica Lunde of Albuquerque, NM, Rachel (Jason) Floyd of Necedah, Maribeth (Steven) Perik Jr. of Arkdale, WI, Sarah (Christopher) Hohenstein of Portage, WI, Garrett Gasienica of Friendship, WI, Shalina (Joseph) Schumer of Necedah, and Peter (Angie) Wollschlager of New Lisbon; adopted grandchildren Chari Dayton of Friendship, WI, and Charlenn (Andrew) Baumgartner of Stevens Point, WI. Great grandchildren, Zachary, Taylor, Thomas Floyd, and Keagan Barrick Floyd, of Necedah, Trenton and Jaxon Perik of Arkdale, Arianna and Hunter Hohenstein of Portage, Addisyn, Syvanna, Kennedy, and Treyven Schumer of Necedah, Jonathan Wollschlager and Kaylyn Barrett of New Lisbon. He is further survived by many other relatives and friends including his nieces Jenny and Shelly (Kenny). Pete was preceded in death by his parents, siblings and wife Nancy Jean Lunde in 2015. Memorial services with full military honors will be held on Saturday, March 23, 2019 at 11:00 a.m. at the Arkdale Trinity Lutheran Church, 1650 Church St., Arkdale, Wisconsin, 54613. Pastor Terri Skildum will officiate. Family and friends are invited for visitation from 9:00 a.m until the time of service at the church. The Torkelson Necedah Family Funeral Home is assisting the family with arrangements. Online condolences may be offered at www.torkelsonfuneralhome.com. "Email Address" would like to share the life celebration of David Peter Lunde. Click on the "link" to go to share a favorite memory or leave a condolence message for the family.